It was Christmastime, last year. My daughter and I had just visited the craft store for some supplies and decided to browse around Pier One, which just happens to be next door to the craft store. They always have such a wonderful display of ornaments and I’m always on the hunt for inspiration. That’s when my daughter saw a painting she loved and asked if I could make one for her. Funny story actually. The employees of Pier One must be worried about the competition stealing their ideas as they were eyeballing me and my camera phone quite suspiciously, and Kristen was supposed to be my lookout. Instead she’s over at the other end of the store drooling over wall art. 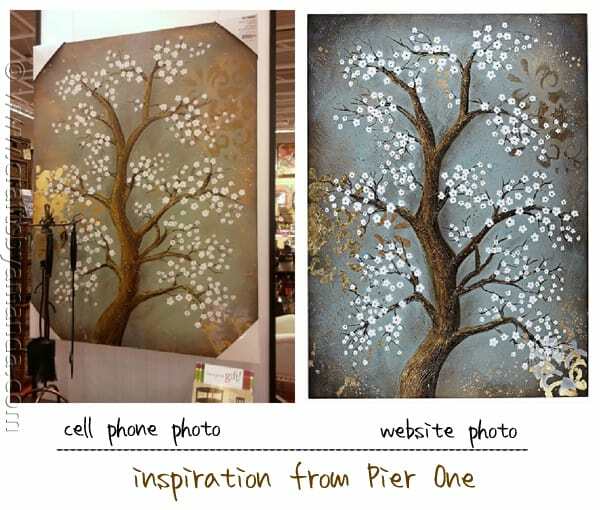 This is the painting that she saw (pictured left, daughter’s cell phone) and the picture on the right is from the Pier One website. 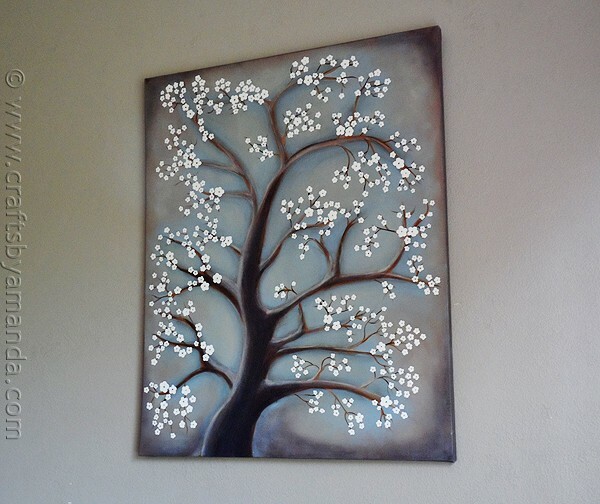 The piece is titled Cherry Blossom Wall Art and sells for $199.95. 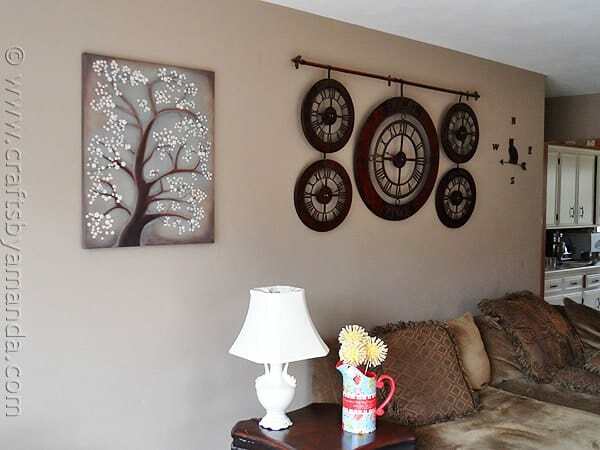 When Kristen was showing it to me, she made a point to say that she didn’t really like the stenciling in the background of the painting, so when I created my own a year later, I left that out. So here we are, fast forward 12 months and my baby girl is moving out on her own. She’s the first of my brood to venture out, though not my oldest, he’s still living here. She and her roommates have secured an apartment 20 minutes away and I wanted to make her something special as a house warming gift. Luck would have it that my contact at DecoArt gave me an assignment that couldn’t have had better timing. 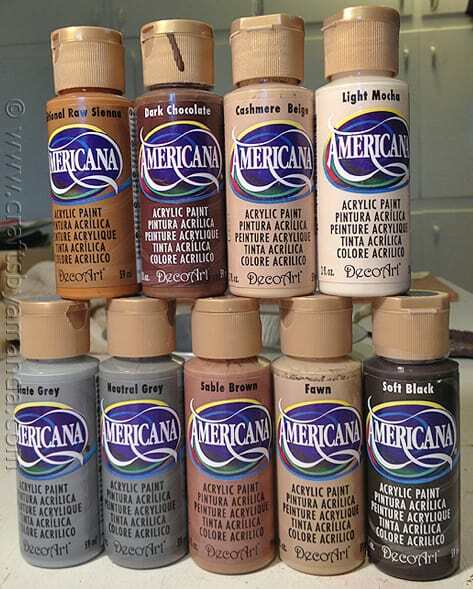 They needed a new photo/project for one of their catalog pages for their Americana paint. 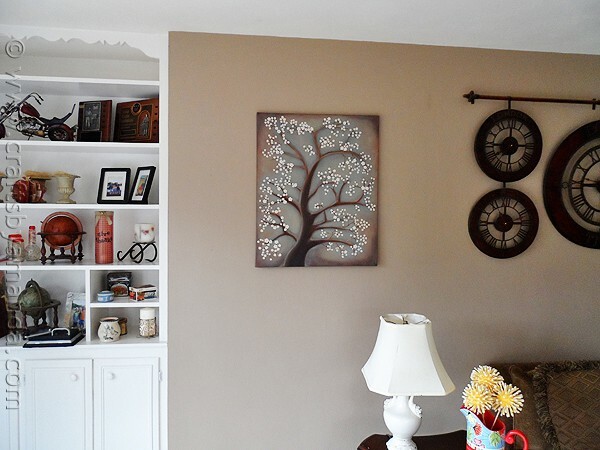 For the project I could only choose from the colors specified on that product page from the catalog. As soon as I saw the colors on the catalog page I knew exactly what I was going to do. 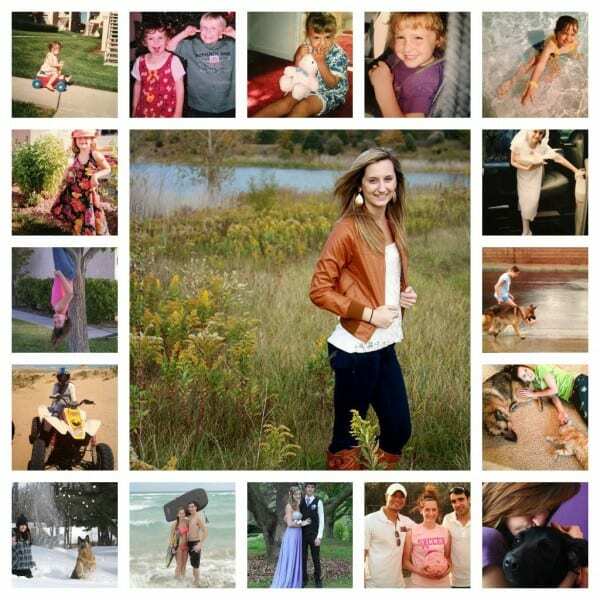 NOTE: Each of the following step photos can be enlarged by simply clicking on the photo. First I thinned out some of the Slate Grey with water, 3 parts paint 1 part water should do it. I applied it to the canvas using a brush, but blended it with a soft cloth. While the canvas was drying, I dropped the cell phone picture of the Pier One painting into Photoshop Elements and added a grid (View > Grid, change grid size in the Preferences). If you don’t have Photoshop, no problem, just use a ruler. I did a quick screen capture of the grid covered photo, then opened the screen capture and printed it. Then I went over the grid lines with a black marker to make them more visible. This was just to help me gauge area while sketching out the tree onto the canvas. Next I used a pencil to lightly draw a skeleton of the tree onto my grey canvas. Once the skeleton was in place, I then added the meat of the tree so to speak, creating the initial outline. For this entire process I needed a lightly damp sponge. So I kept a small tub of water and a hand towel nearby. The sponge should be barely damp. Get it wet, squeeze all the excess out, then blot it on the towel. 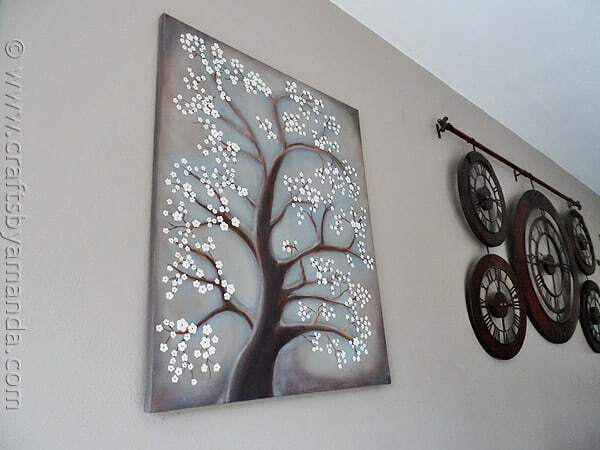 First I shaded around the tree using Neutral Grey. To do this, I worked in small sections. This is important since acrylic paint dries fairly quickly. 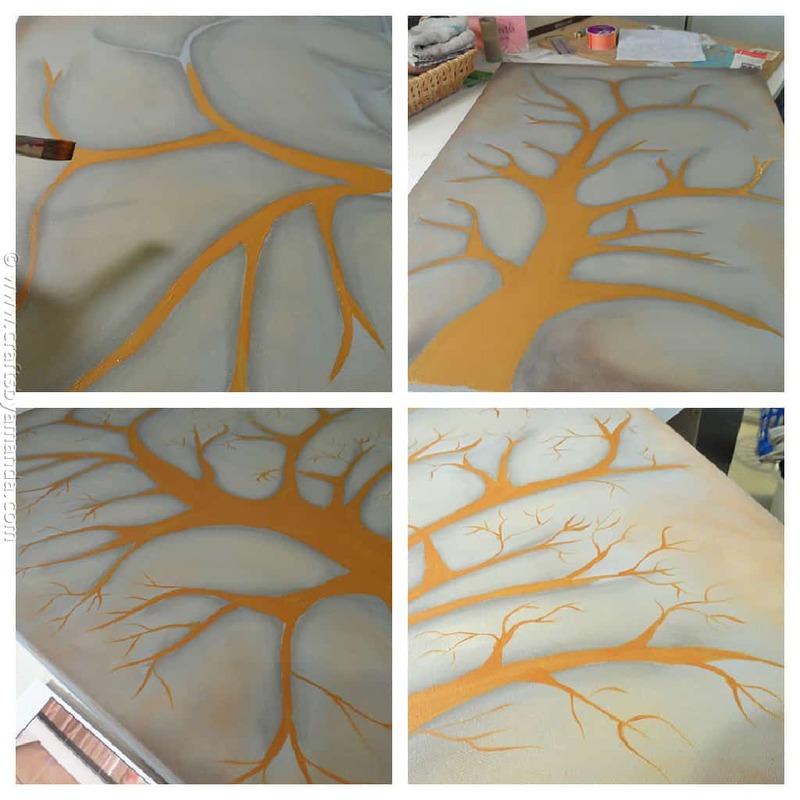 First I painted around the outline of the tree, then blended it with the damp sponge by running the sponge almost to the outline and blending the paint outward. Next, using Sable Brown and a sponge applicator (pouncer), I added some color to the outer edges of the canvas. Again, I blended the paint with the damp sponge. I used Fawn, and the same method as the previous step, to add some highlighting in between each of the branch sections. Blend, blend, blend! Finally, I used small dabs of Soft Black around the corners of the canvas. In this instance, I did use a wee bit more moisture in the sponge since I was blending such a dark color. This helped with spreading it out more. I filled in the tree using Traditional Raw Sienna. 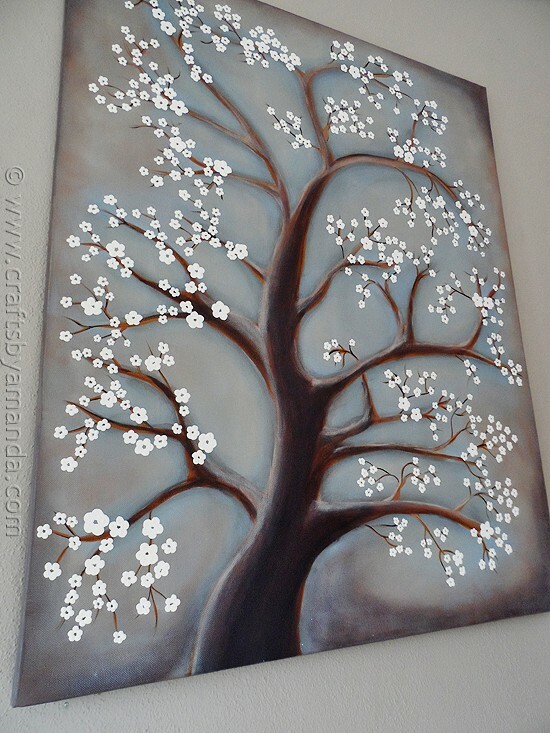 Then I used a long liner brush to add the details on the branches. 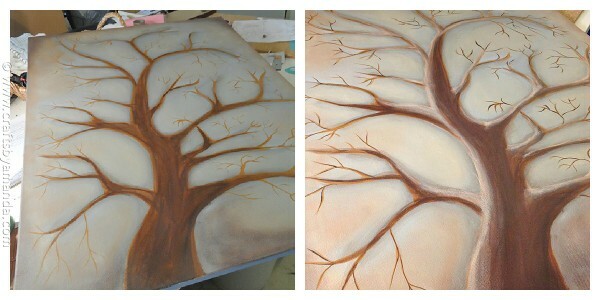 To add depth to the tree, I mixed together Dark Chocolate and Soft Black and added it over the Traditional Raw Sienna. I made sure that there was some of the base color still showing through, and I blended with the damp sponge as well. This had to sit and dry completely before the next step. To highlight the tree, I used Cashmere Beige and blended the edges with the sponge. 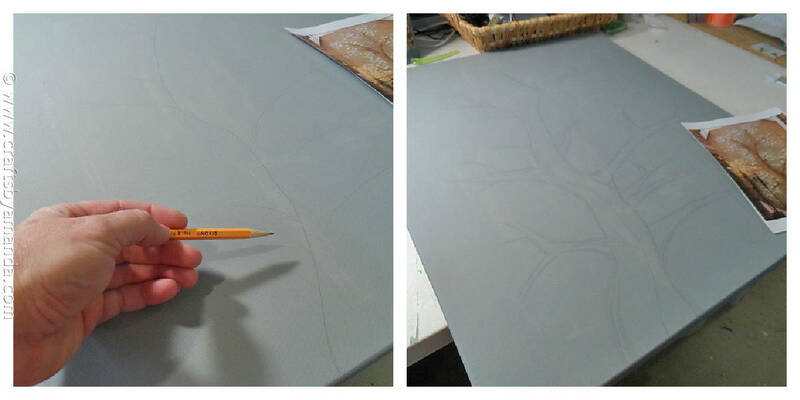 To finish off the branches I used a long liner brush and Soft Black, and traced over the thin lines on the twigs. I purposely didn’t cover them completely, I wanted the lighter color showing through. Now I was ready to add the flowers, which by the way is a lot like icing a cake. It makes you smile and you know that you are not only in the final stretch, but you’re about to add a bunch of beauty to your creation. Dip the handle end of a paintbrush into Light Mocha. 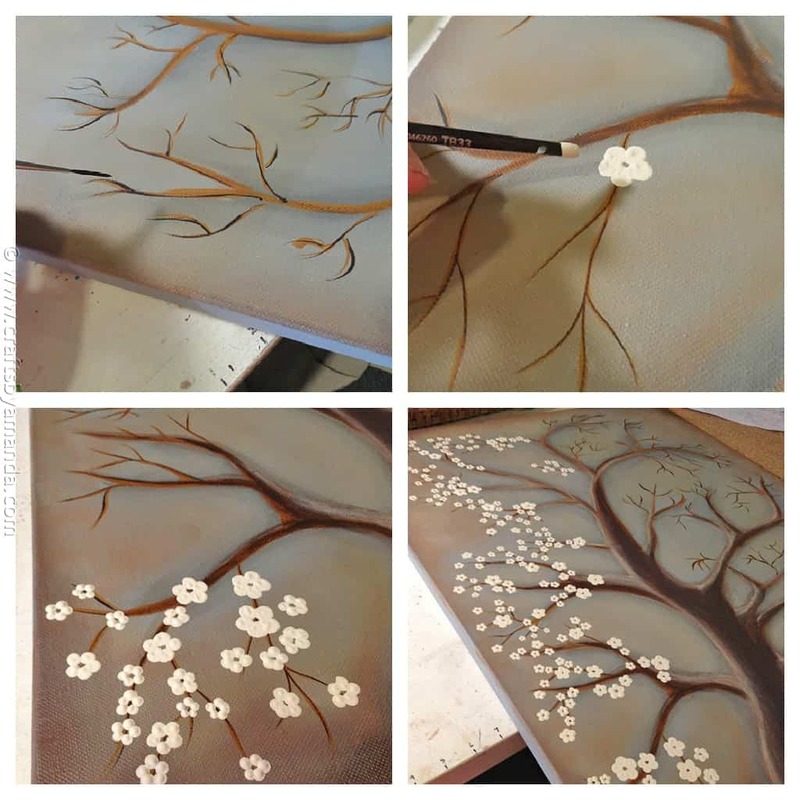 Small flowers can be created using just a dot and a small amount of paint, while larger flowers you’ll need more paint and you’ll “draw” them on using a circular motion. Just keep adding them until you are happy with the results. Let everything dry really well. When the painting is completely dry, give it a nice even coat of sealer. Wait an hour or so and give it another coat. 20 minutes later, a third and final coat, just for good measure. 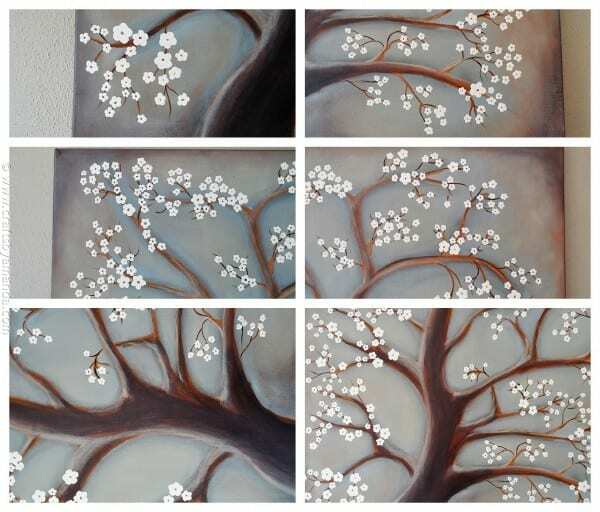 Here are some close ups of the different areas of the painting. Thank you so much, and thank you to everyone for your compliments, it’s most appreciated! Would you be willing to make another to sell?! I could never do this, nor do I want to try, but I absolutely love this and the colors!!!! Thanks so much for the compliment Claudia! I don’t sell my work, but I do appreciate the kind words. thank you! Wow. I love this. Absolutely beautiful!! Your version is EVEN BETTER!! So gorgeous…if you wanna practice some more, you can make me one too. LOL. WOW! so much detail! beautiful work. I love this tree! I am going to have to make one! 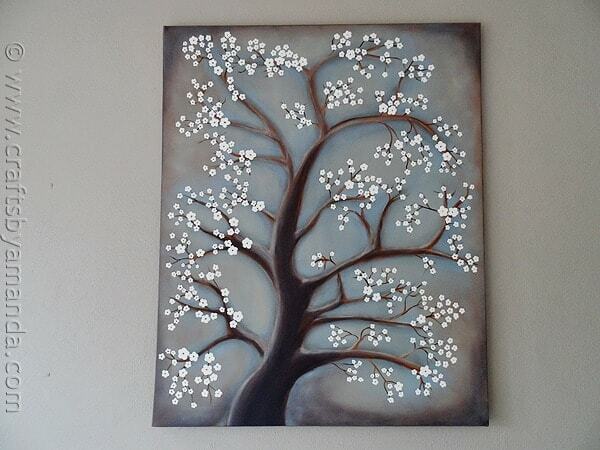 Hum, I wonder how you’d paint dogwood blossoms. That would be great to have around Easter! Beautiful…just beautiful…wishing your daughter the best of luck in life! Incredible job you did. You made a wonderful tutorial too. 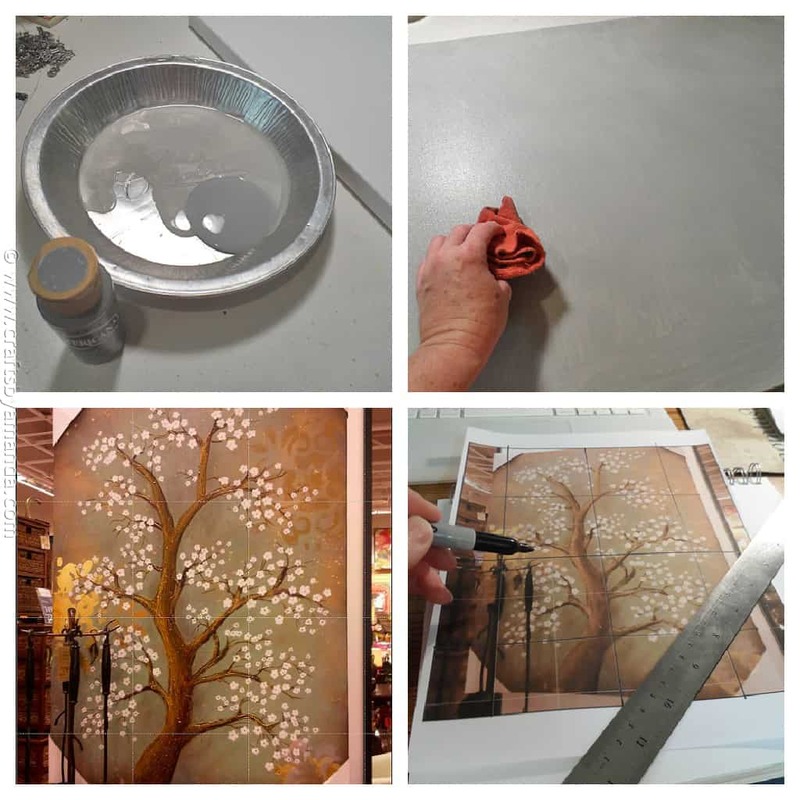 Thanks for the tips of using a grid and using a sponge to blend acrylic paint!! Your painting is lovely!! Love, Love it better than the Peir One you are so talented and your daughter is so lucky to have a talented mom like you. You are extremely talented!!!! I could never make it look as good as yours. Will you consider making another to sell? I would absolutely love it! 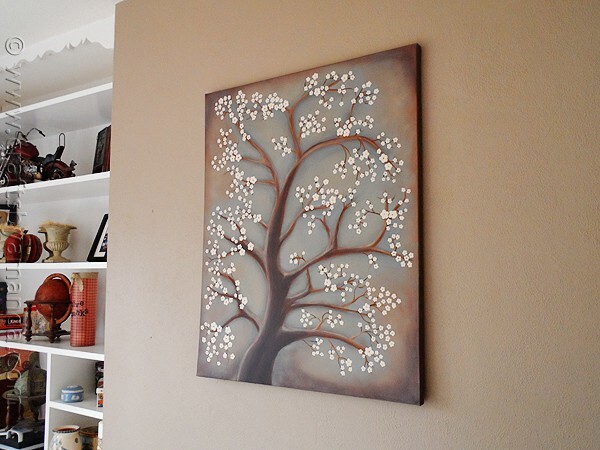 I would love to be able to do this….it is beautiful! holy wow!!! Your daughter is so lucky!!! I love this so much!!! I use other artists photographs for my painting inspiration- but would never copy a work to sell…I think that is copyright infringement. Making it for your daughter is finE, but going on to sell someone else’s ideas as your own doesn’t sit well with me(as an artist myself). However I think it’s fine to share the techniques you used to copy. Even those easy paintings done at wine and paint places are copyrighted, you need to be careful. 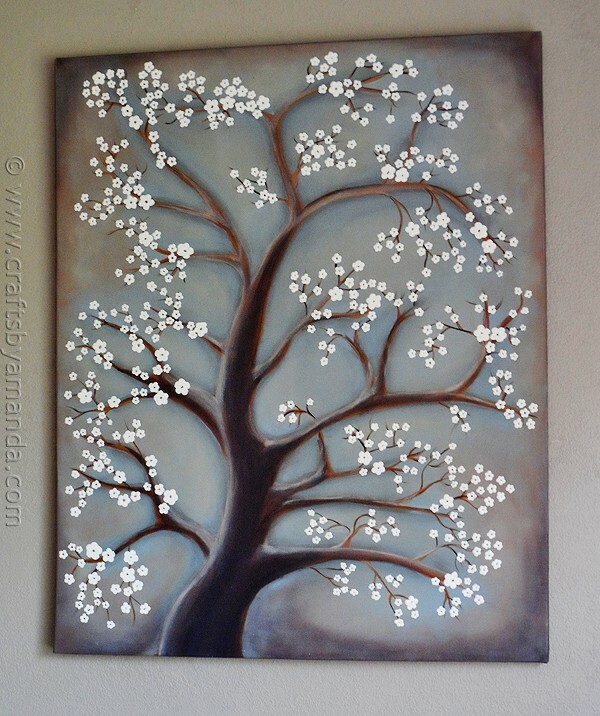 I agree, I wouldn’t sell my painting if I used another artist’s work as inspiration, unless of course it was different enough. I can see how the post you read may have not made that clear, but I was discussing selling my “portraits on wood” even though I receive lots of requests for my other work.